Question 1:-A certain computer hard disk drive is rated to withstand an acceleration of 100g without damage. Assuming the drive decelerates through a distance of 2 mm when it hits the ground, from how high can you drop the drive without running it? From this expression, we calculate the speed of the disk just before it hits the ground but in terms of height y. Since the speed of the disk before collision is known from above, we can equate the limiting value of acceleration to account for the height y from which the disk can be thrown without damaging it. Where vy represents the final speed of the disk, a is its acceleration, v0y is the initial speed and  is the time taken by the disk to attain the final speed vy. Since the disk will come to rest after colliding, hits final speed v'y is zero. Also the initial speed before collision is equal to vy calculated above. Given that the disk crushes to a depth of  2 mm, the height y' can be equated to it. Therefore if the disk is thrown from height 0.2 m the disk will start to damage, therefore the person can throw the disk from any height which is less than 0.2 m and avoid damaging it. Question 2:- A high-performance jet plane, practicing radar avoidance maneuvers, is in horizontal flight 35 m above the level ground. Suddenly, the plane encounters terrain that slopes gently upward at 4.3°, an amount difficult to detect; see below figure-1. How much time does the pilot have to make a correction if the plane is to avoid flying into the ground? The airspeed is 1300 km/h. Inclination of slope, ? = 4.3°. Altitude of plane,  h = 35 m.
Speed of air, vair = 1300 km/h. Let us assume that the length of slope to the point where the plane meets the slope is given by length l. Also, the speed of the plane is equal in magnitude with that of the speed of air, therefore the speed of the plane (say vplane) is equal to 1300 km/h. d = l sin ? Therefore the length of the slope after which the plane collides is 466.7 m.
x = l cos ? 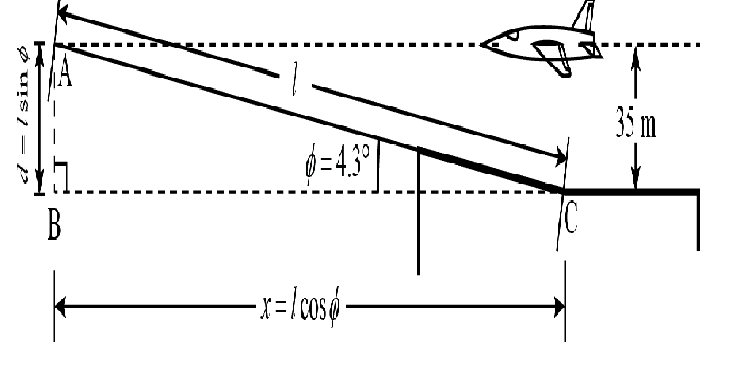 Therefore the horizontal distance at which the plane will collide with the slope is 465.3 m.
Therefore the plane has 1.3 s before it will run into the ground, and avoid the collision. Question 3:-A juggler juggles 5 balls with two hands. Each ball rises 2 meters above her hands. Approximately how many times per minute does each hand toss a ball? The convention chosen is such that the downward motion is consider as positive. The time (t) calculated above accounts for the time taken by the ball to reach the hand of the juggler from the maximum height it attains, therefore to calculate the time say t', for which the ball stays in the air, multiple the time (t) by 2. By the time the ball left from one hand and reached the other, the juggler must have thrown 5 balls so that he can be ready to throw the ball reaching his hand again.Therefore, if the juggler has thrown 5 balls in time t', he would throw (5/t') (1 min) times each ball with his two hands in 1 min. Given that the ball rise 2 m above the hand, the distance y travelled by the ball when he descends from the maximum height to reach the juggler hand is 2 m. Also the free fall acceleration is 9.81 m/s2. The juggler has to juggles each ball once before time t ' so that he gets ready to juggle the ball reaching him again. Therefore the juggler juggles at a rate of 117 toss per minute with each hand.